Do you love the thrill of leaping without looking? Or do you prefer a safety-first approach? 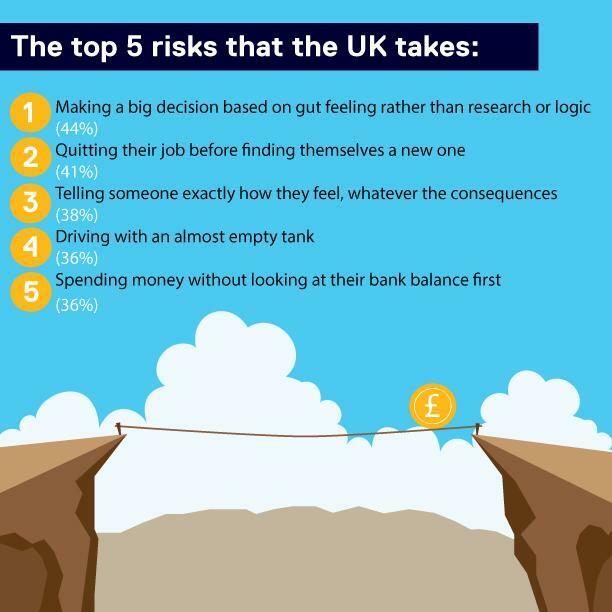 We recently asked over 2,000 people across the UK* about their attitudes to risk and now you can see if your risk-taking ways match those of the nation. So, the top 5 may not seem like anything out of the ordinary, yet taking a closer look at the research reveals some interesting trends on what we take a chance on. Men are more likely to risk not filling up the car when they need to (40%) than women (33%). Nearly half of those aged 55 to 64 admit to driving with an almost empty tank (43%). Half of Belfast residents (50%) say that they have let their car run on fumes. Men (19.4%) are more likely than women (13.2%) to go skinny dipping. Those from Belfast (22.9%) and Norwich (22.2%) are willing to show their cheeky side more than those from any other city in the UK. Men (27.2%) are more likely than women (24.5%) to go on a blind date, while it’s pretty much an even split when it comes to how many men and women tell someone how they feel (37.9% vs 38.7%). Belfast residents are more likely to reveal their feelings to a love interest than anyone else in the UK (66.7%). 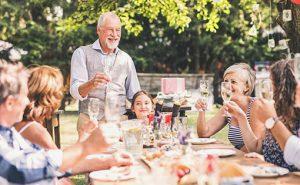 Generally, we are more likely to take a chance on a blind date as we get older. For those aged 18-24 are less likely to do this (12.8%) compared to people aged 65+ (30.8%). 35% of us spend money without looking at our bank balances first. 42.6% of people aged 35-44 don’t check their bank balance before spending. Yet, this drops to 29.4% for those aged 65+. Men (9.9%) are more likely to take out a significant loan to invest in a new, unknown venture than women (6.7%). Although some risks might not be your cup of tea, (perhaps the skinny dipping! ), it’s human nature to take them. We are constantly making risk assessments, from the tiny to the possibly life-changing. The question is, how much risk are you prepared to take? Play our quick quiz and find out what type of risk-taker you are. Click here to play the quiz and find out what kind of risk-taker you are! *Portafina surveyed 2,009 UK adults in February 2018.